Air Costa inaugurated Aviation Security Training Institute (ASTI) on 02nd February 2015 by Mr. A.B.Venkateshwara Rao, IPS, Commissioner of Police, Vijayawada City and other guests of honours in its Corporate Office, Vijayawada. Air Costa has crossed another milestone in Aviation by establishing Aviation Security Training Institute which has been approved by Bureau of Civil Aviation Security, Ministry of Civil Aviation, Government of India, New Delhi. Air Costa has been authorized by BCAS to conduct Aviation Security Trainings for its Security Staff, Cockpit and Cabin Crew. This institute can also provide training to other airlines for the security requirement as per BCAS guidelines. ASTI was setup with three state of the art Computer based training (CBT) classrooms, which is equipped with a full-fledged library along with IEDs. In inaugural function held at Air Costa Corporate office on 02 February 2015, Mr. A.B.Venkateshwara Rao, IPS, Commissioner of Police, Vijayawada City, attended as Chief Guest and declared Air Costa's Aviation Security Training Institute (ASTI) open. Mr. Raj Kishore, Director, Gannavaram Airport, Mr. Rajeev Kumar, ACP, Gannavaram Airport, were the other Guests of Honour attended the function. 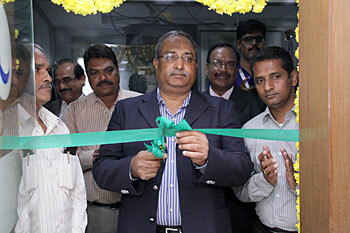 Mr. L V S Rajashekar, Managing Director, Air Costa, Capt. K N Babu, CEO, Air Costa and all the Head of the Departments of Air Costa attended the inaugural function. Speaking on this occasion, Mr. A.B.Venkateshwara Rao, IPS., Commissioner of Police, Vijayawada City congratulated Air Costa for setting up the Aviation Security Training Institute, the first of its kind in Andhra Pradesh and said that Air Costa has set very high standards in terms regional connectivity and appreciating managements efforts in extending their services to more sectors with their courteous crew. He requested Air Costa to extend Aviation Security Training facility to the State police on requirement basis posted in Vijayawada Airport. With the inauguration of ASTI, Air Costa has commenced its 6 day AVSEC Training for Air Costa crew from 02-02-2015 to 07-02-2015. 6 Pilots and 19 cabin crew are undergoing the AVSEC Training at Air Costa ASTI, located at Air Costa Corporate Office, Vijayawada. Air Costa, part of the LEPL group, is a scheduled regional airline in India and has recently completed one year of commercial operations. It currently has 34 daily flights and connects 9 cities namely Chennai, Bangalore, Hyderabad, Jaipur, Ahmedabad, Tirupati, Coimbatore, Visakhapatnam and Vijayawada. Air Costa operates the Embraer E170 (67 seats) and E190 (112 seats) Jets.